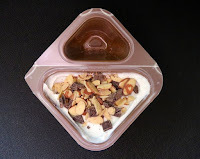 Welcome to Day #6 of Chocolate and Nuts Theme Week. 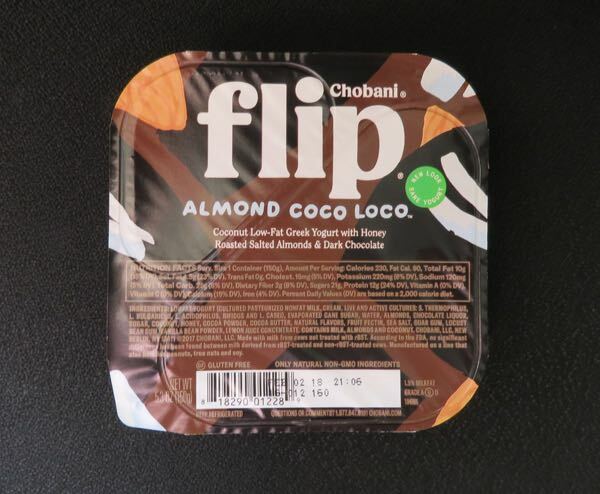 Today's Chobani flip* Almond Coco Loco Greek yogurt was from Chobani, LLC (New Berlin, NY). Coconut low-fat (1.5 % milkfat) Greek yogurt was paired with pieces of honey roasted salted almonds and dark chocolate. 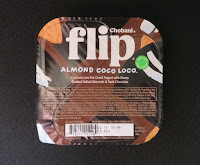 This coconut yogurt was not quite as sweet as its caramel yogurt and peanut milk chocolate sibling (featured yesterday). 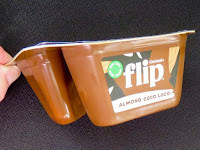 I liked today's blend of coconut, almonds and dark chocolate a bit better than the peanut caramel and milk chocolate. *The flip in the Chobani flip name referred to the bending and flipping over of a smaller compartment (of milk chocolate and peanut pieces) into a larger yogurt compartment. The peanuts likely stay crunchier this way.